For a game website, I must say that we here at BrainLazy have been remiss in our coverage of Steam Greenlight. Steam has been a godsend for indie games and indie developers, becoming the defacto platform for folks with something too outside the mainstream or too low budget to get on the consoles. Steam Greenlight is an attempt to open the door just a little bit further, giving deserving titles an extra hand. 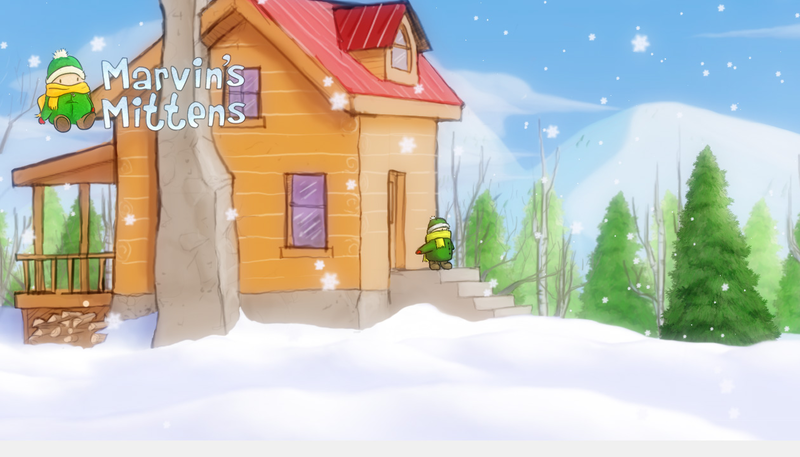 Marvin’s Mittens is a game involved in Steam Greenlight. Let’s see what it has to offer. Marvin’s Mittens is an exceptionally well executed game across the board, but the visuals are certainly among its strongest areas. 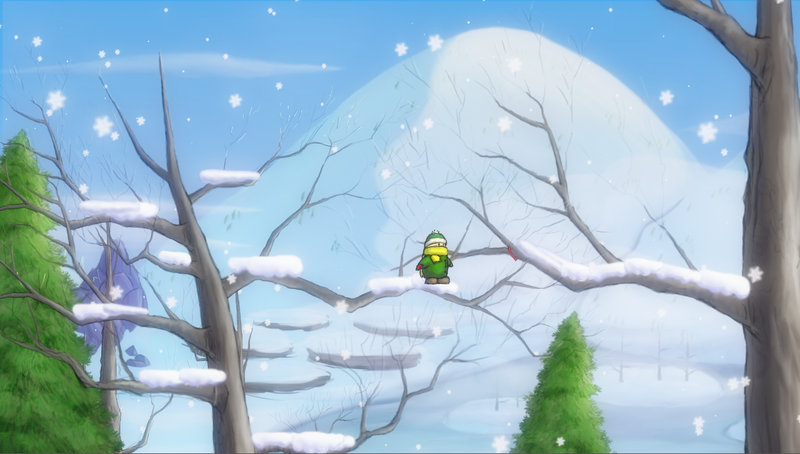 It is a 2D platformer with a snowy setting and a child for a main character. 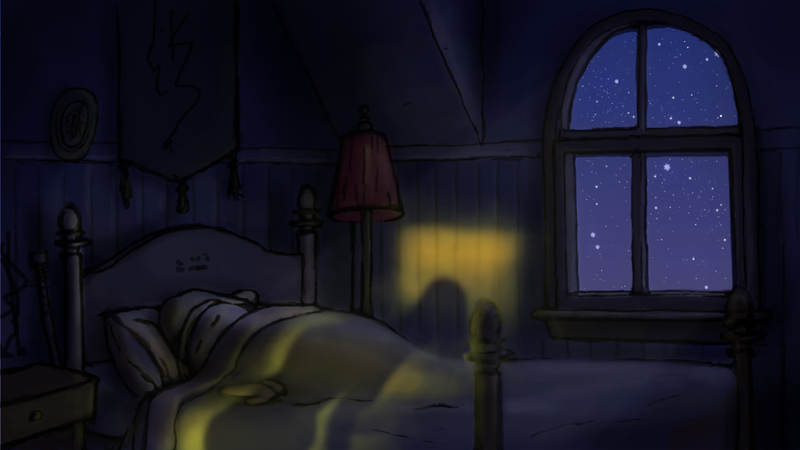 Everything from the backgrounds to the characters have a hand drawn, hand animated feel. I’ve frequently stated that my favorite style of artwork in 2D games is the super-crisp cartoon style you get from vector art, but Marvin’s Mittens takes a different route that I must say is no less striking. The artwork has a colored pencil or even painted look to it. It gives the whole game a feel closer to the illustrations in a story book or a comic strip than to a Saturday morning cartoon. As a matter of fact, at times I found myself remarking how a given scene reminded me of something from Calvin and Hobbes or Peanuts. Naturally this means that the animation is fairly limited in terms of frames, but each frame has the look of hand-rendered strokes. It leaves you with the sensation that you are looking at something that someone made, rather that the product of flawless computer generation. Much of the game seems crafted to show off the artistic elements of the environment. Animals can be found in your travels that inspire Marvin to make a quick sketch (and he’s a gifted little scamp). Rather than remaining static, the sky and lighting gradually change as you play, drifting from bright morning to starry evening before finally it is time to come in for the night. The setting, though always wintery, is remarkably varied, taking you from the bottom of a frozen lake to the top of a tall (and then a taller) mountain, and even into the sky. 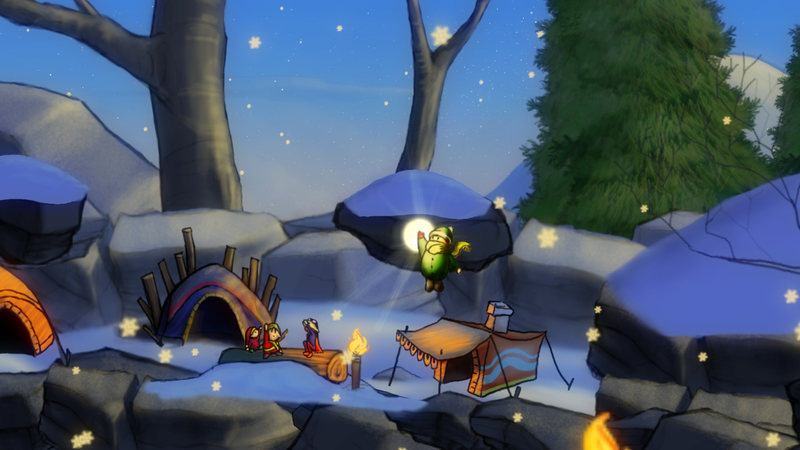 The levels are also littered with little touches, such as a telltale thread from the namesake mittens dangling from a tree to landmarks of previous levels showing up in the background of later ones. A sharp eye will catch your house, railroad tracks, and the mountains behind you as you progress. Aha! A clue. The game is afoot! Despite the artsy nature of the visuals, they still do the job when it comes to gameplay and utility. Occasionally it was difficult to tell a platform from a piece of the background, but for the most part it is quite clear, with clumps of snow marking places to safely land and floating snowflake collectibles helping to guide you forward. Signs are erected to let you know when certain items or actions are appropriate. Though I would say the game is more about form, they didn’t neglect the function, and that’s nice to see. Marvin’s Mittens is very non-traditional as far as games go. Most 2D platformers are about navigating an environment to reach a destination, avoiding dangers and collecting powerups along the way. Most of those elements are present here, but usually in only the most subtle and gentle of forms. There are no enemies and no real hazards. With the exception of one or two encounters with “monsters”, there is nothing in the game with so much as the remote appearance of danger. You always feel safe. Some would say that there is very little “game” to this game. It is more about exploration than anything else. You begin with only the ability to run and jump, and you can do neither activity to an impressive degree. Eventually you unlock the ability to double jump with a mechanic vaguely similar to Yoshi’s “running desperately in midair” jump in Yoshi’s Island and Smash Bros. The collectibles aren’t there to give you extra lives or stronger attacks, because there is nothing to fight and you cannot die. Instead, the drifting snowflakes you collect give you the ability to float a little bit higher with each jump. In turn, you are better able to explore and are able to reach more snowflakes. Amazingly, even one of the non-combat dangers related to sprawling platformers such as this has been carefully defused by Breakfall, the devs behind this game. You see, you’re a little kid, and though your mother seems to provide you with an almost terrifying amount of freedom (letting you descend onto caves or leap about on cliffs), when nightfall comes she’ll call you home for the night. This brings you back to your bedroom, to begin the next day’s adventures from home. On one hand, this adds a bit of challenge in that you only have a set amount of time to travel forward before having to begin again (a bit like Ocarina of Time, I suppose). On the other hand, it means that even if you are hopelessly lost in a maze-like underground cave, in time you’ll be back home without the frustration of having to find your way out. I don't know. The way she can call me no matter how far I am, and the way that she watches me all night while I sleep... Mom's starting to creep me out. Okay, so if you have to start over from the beginning each day, doesn’t that mean that the game will eventually degenerate into a mad dash forward without the time to fully explore each area? No sir. You see, dangling above you on one early screen is a sled. Once you collect enough flakes to reach it, you gain the ability to slide down snowy hills. Add to that the fact that most levels have a marked stone that can be removed by guiding a helpful elf to it, and eventually you have a network of shortcuts that will take you deep into the game in mere moments. The game even goes so far as to have Marvin burst from his home on the sled each morning, and you barely have to touch the controls to allow him to slide to the furthest level you’ve managed to unlock. The gameplay has a bit more depth, encouraging you to find each of eleven sketch-worthy animals and allowing you to follow multiple paths, but even with these elements it won’t take you more than a few hours to play it from beginning to end. I can’t say that this game is for everyone. If you are an art appreciator, or if you like a slow and gentle bit of exploration, then this game will provide you with much to enjoy. If you are into faster games, or games that challenge your mind and reflexes, you’ll probably find yourself losing interest fairly quickly. I would say that even the most paranoid game-hating alarmist would be hard pressed to find anything in Marvin’s Mittens objectionable… except perhaps the near negligence of the mother. But hey, she’s got an all-powerful voice that can effortlessly reach you even deep underground, so I’d say she’s got the situation well in hand. The music is just as gentle and soothing as the visuals, particularly the lullaby your mother sings at the end of each day. Dialogue is limited, with comments like “All right!” and “My mitten!” comprising most of the speaking parts, but here and there you’ll hear a few humorous exchanges. Marvin’s exertion noises when he jumps are occasionally confusing. (I’m not sure I’d exclaim “Hee!” when leaping.) But overall the audio experience is just has high quality and artistic as the visual one. I think Mom needs to switch to a less powerful fabric softener. You are Marvin. One of your mittens is stolen by an antler-bearing blur. At first, you take it in stride, but your other mitten (which seems to have some sort of otherworldly power) feels differently about the matter. Soon you discover that there is a mitten-snatching epidemic, and only you, the mighty Marvin, can get to the bottom of it. Okay, so the way I tell it is a good deal more epic than the story is presented in the game, but gosh darn it, my brain is designed for spectacle. For what it’s worth, the story is deep enough to have what you might call a twist, and it is certainly enough of a plot to justify your adventure, which as I’ve said many times in the past is often all the story that a game really needs. Marvin’s Mittens isn’t a thrill-a-minute roller coaster of a game. It is a gorgeously drawn, well scored, and solidly coded exploration of a child’s winter wonderland. If you need something safe for your youngest to play, this is the game for you. If you want to see and hear something simple and beautiful, check it out as well. If you want to carve a bloody swath through legions of the undead… maybe look for a game that doesn’t mention mittens in the title. 8.2 / 10: Though more artistic and less challenging than some would crave from a game, Marvin’s Mittens is a well made treat for the eyes and the ears, and a gentle and soothing way to spend a few hours. I don’t know. The way she can call me no matter how far I am, and the way that she watches me all night while I sleep… Mom’s starting to creep me out. The game looks great. I used to work with the guys that made this. They’re awesome!